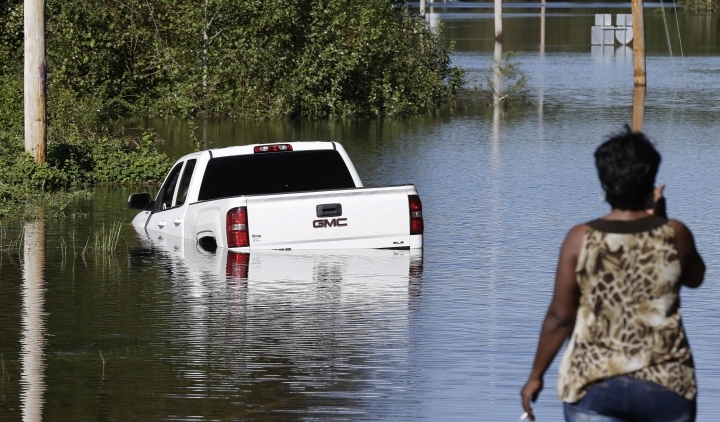 Two people have died after a van was overtaken by rising flood waters in South Carolina. 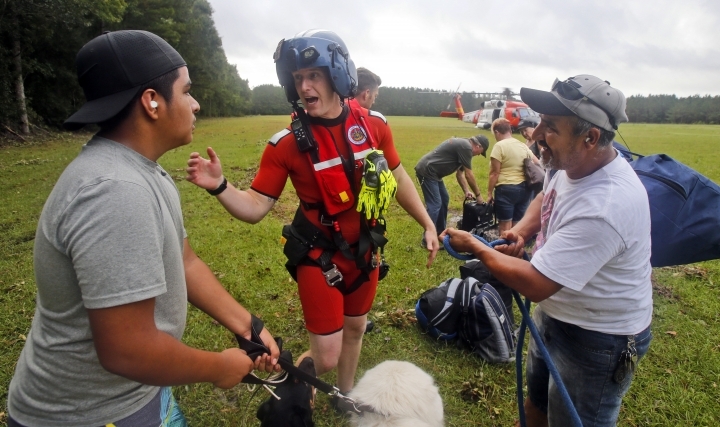 Marion County Coroner Jerry Richardson tells The Associated Press that two women drowned at around 6 p.m. Tuesday when a van tried to cross a roadway between Mullins and Nichols and was overtaken by water. Richardson didn't release their names. He said two other people were sent to a hospital for observation. Richardson said the van was traveling near the Little Pee Dee River, one of the bodies of water officials in South Carolina are watching closely as water continues to pour into the state from upriver in North Carolina following the heavy rains of Florence. Richardson said "They were trying to negotiate through fast-running water, and it just didn't work out." He says the van is still in the water. Forecasters predict some rivers in the northeastern area of the state might not reach their highest levels until later this week or next week. Authorities have closed a vehicle bridge in Fayetteville after the swollen Cape Fear River began touching the girders supporting the bridge's top deck. The Person Street Bridge was closed at 6 p.m. Tuesday by state transportation officials once the river reached 61 feet (18 meters) amid severe flooding in the aftermath of Hurricane Florence. Water also has begun pooling on nearby streets. Fayetteville Mayor Mitch Colvin says it's unclear if the bridge is threatened by all that water. "We've never had it at those levels before so we don't really know what the impact will be just yet," he says. Florence struck North Carolina on Friday as a hurricane and dumped enormous amounts of rain before weakening, causing river levels to rise to record or near-record levels. The N.C. Department of Transportation says flooding is prompting officials to close a bridge over the Cape Fear River in one city as well as part of an interstate over the same river. A statement from the department Tuesday says it will close the Person Street Bridge in Fayetteville, and also shut down Interstate 95 between mile markers 46 and 56. Transportation officials are also closely monitoring another bridge in Fayetteville it says will be closed if the water level reaches the girders, which support the deck. With the impending closure, I-95 will be closed in both directions between exits 13 and 56 and between exits 65 and 81. Near Rocky Mount, southbound traffic is being detoured off the interstate at exit 138 and being sent to Charlotte and into South Carolina. State transportation officials will continue to monitor water levels and open I-95 as soon as possible. The National Weather Service says a microburst, not a tornado, caused damage in a town near Boston as the remnants of Hurricane Florence brought strong winds and heavy rains to New England. Downed trees and tree limbs were reported Tuesday in Saugus, with some of them falling onto homes. A tornado warning had been issued for the area. A Weather Service survey team inspected the damage later in the day and determined a microburst, or strong storm downdraft, was the cause. The team was trying to determine the estimated wind speeds. The Weather Service says 5 to 6 inches (12-15 centimeters) of rain were reported to have fallen in parts of Massachusetts. The service issued flash flood warnings and watches for parts of Massachusetts, Rhode Island and Connecticut. North Carolina officials say their state's death toll from Florence has risen to 27. Sonja Bennett-Bellamy, a spokeswoman for the Department of Public Safety, said Tuesday that a 46-year-old woman was killed in Rutherford County when a tree fell on her vehicle while she was driving. The fatality brings the overall storm death toll to at least 35 in three states. A North Carolina health care system has set up a mobile hospital in a parking lot to provide medical care to people who need help after Florence. Atrium Health said in a news release that the medical unit, MED-1, was dispatched to the town of Burgaw in Pender County after the local hospital closed because of the storm. A spokesman said it will be the only medical facility within a 50-mile (80-kilometer) radius. MED-1 is staffed by emergency room doctors, nurses and other medical staff. The group can treat everything from minor injuries to trauma surgery. Dr. David Callaway, an emergency medicine physician and medical director for MED-1, says the team performed surgery on a woman suffering from diabetes and an abscess in her stomach. Callaway says that had the woman stayed at home a day longer, she might have gotten sicker or possibly died. A county official in North Carolina says a relatively small, nonregulated dam failed amid flooding in the aftermath of Florence, prompting some evacuations but no major problems. Anson County Emergency Manager Rodney Diggs said Tuesday that the dam at a sand and gravel plant failed Monday afternoon. That raised concerns about the possibility of other breaches downstream, so about 12 homes were evacuated. The water has since gone down, and Diggs says everyone has been able to return to their homes. Even though the structure wasn't among the state's regulated dams, Diggs says county officials requested that inspectors take a look, given how much rain has fallen. President Donald Trump will have a firsthand look at the impact of former Hurricane Florence. White House press secretary Sarah Sanders says Trump plans to travel on Wednesday to North Carolina, which bore the brunt of the powerful storm. Days after the hurricane rolled through, the region is dealing with massive flooding. 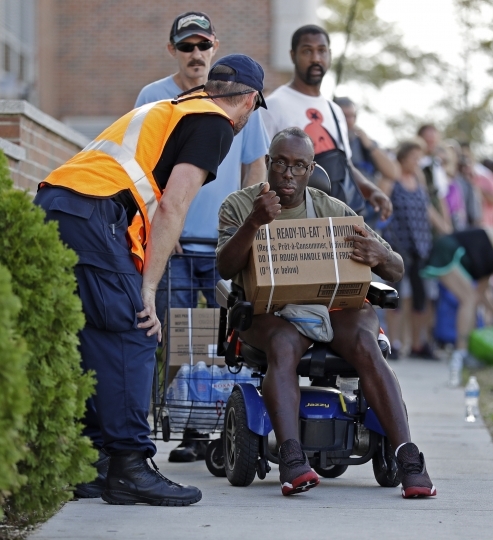 In Wilmington, North Carolina, residents lined up by the hundreds Tuesday for free food, water and tarps while officials managed to open two routes into the water locked city. Florence is being blamed for at least 34 deaths in three states. Remnants of the once-powerful Category 4 hurricane are now a rainy, windy mass of low pressure. Forecasters say it could still be several days before rivers in South Carolina crest. That's because water is flowing into them from North Carolina rivers swollen by Florence's relentless rains. National Weather Service officials said Tuesday that the Pee Dee River was beginning to crest at the town of Cheraw but it would take several days or more for it to reach its high point downstream. Many areas in the northeastern portion of the state are beginning to fill with water after torrential rains delivered by Florence. Gov. 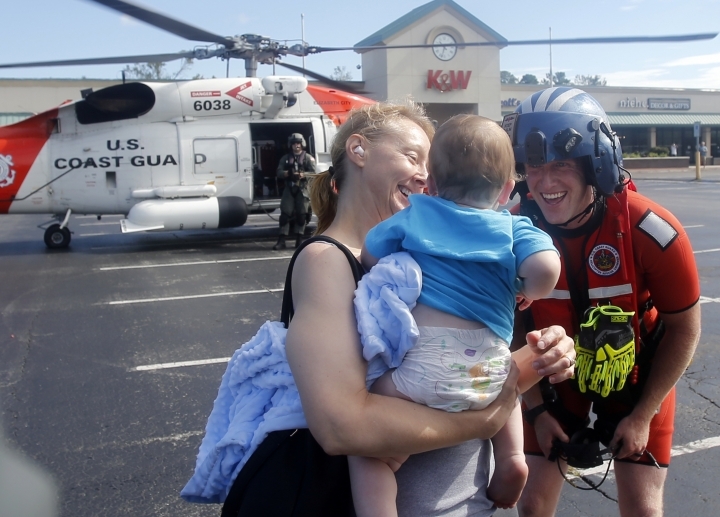 Henry McMaster flew over the area in a helicopter with the National Guard on Monday. McMaster warned that counties in that area would continue to flood as water flows into the state toward the ocean at the Myrtle Beach area. A Missouri-based organization is bringing a traditional North Carolina staple to areas trying to recover from the former Hurricane Florence. 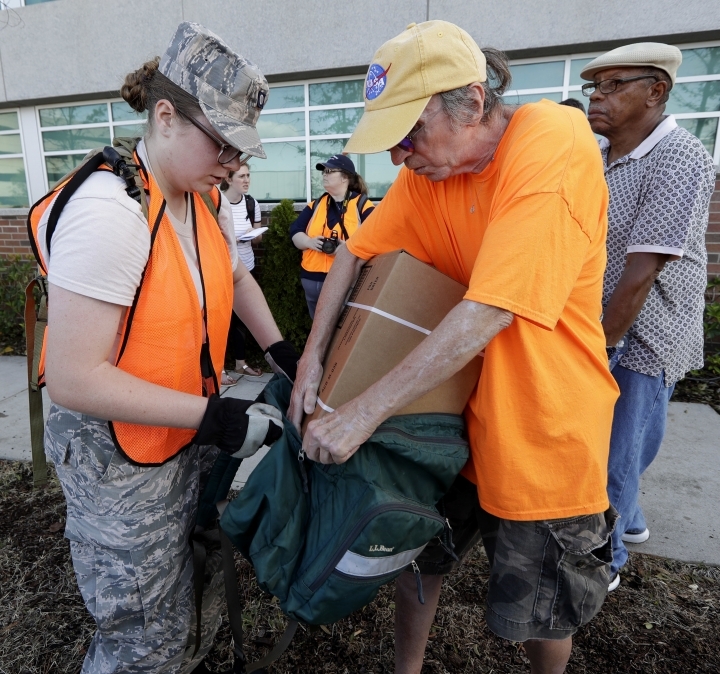 Operation BBQ Relief said in a statement Tuesday that it had deployed its group of barbecue enthusiasts to Wilmington and Fayetteville to support recovery efforts by providing hot meals to displaced residents and first responders. The organization says the Wilmington and Fayetteville deployment locations are capable of producing up to 50,000 meals per day. The organization was established in 2011 following a devastating tornado in Joplin, Missouri. 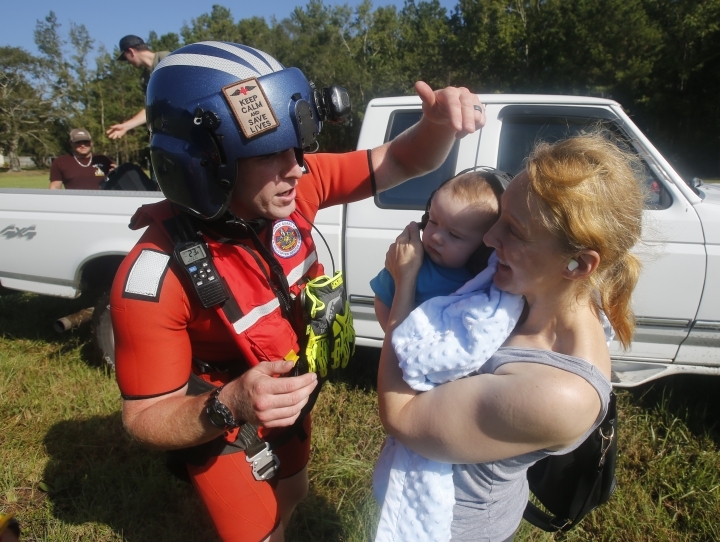 Since then, the organization has deployed to disasters including South Carolina flooding in 2016 and Hurricane Harvey in 2017. Worried West Virginians got a reprieve when predictions of possible devastation didn't come to fruition from the remnants of Florence. Before the storm made landfall last week, forecasters said it could result in "life-threatening, catastrophic flooding rainfall" across the mountains of western North Carolina, western Virginia and eastern West Virginia. Instead, the storm brought 1 to 2 inches (2.5 to 5 centimeters) of rain in much of West Virginia before moving out early Tuesday. The state is still recovering from June 2016 floods that killed 23 people statewide. The Greenbrier County community of Rainelle had braced for the worst from Florence, even moving its fleet of trucks to higher ground in anticipation of the storm. Sections of the Blue Ridge Parkway have opened now that debris scattered by Florence has been cleared. A statement from the National Park Service Tuesday said the stretch of parkway known as the "Asheville commuter zone" is now open from milepost 375.7 at Ox Creek Road just north of Asheville to the parkway's terminus at milepost 469 at Great Smoky Mountains National Park. The parkway in North Carolina is also open from milepost 290.8 at Green Hill Road to milepost 317.5 at U.S. Highway 221, including Linville Falls. The park service said campgrounds in those sections will reopen at noon on Wednesday. NBA legend Michael Jordan, who played high school basketball in Wilmington, North Carolina —one of the areas devastated by Hurricane Florence— is donating $2 million to assist residents of the Carolinas. The 55-year-old owner of the NBA's Charlotte Hornets is contributing $1 million each to the American Red Cross and the Foundation For The Carolinas' Hurricane Florence Response Fund. In addition, more than 100 members of the Hornets organization will help pack disaster food boxes Friday at Second Harvest Food Bank of Metrolina in Charlotte, North Carolina. The disaster food boxes, which provide individual meals, will be shipped to Wilmington, N.C., Fayetteville, N.C., and Myrtle Beach, S.C., and distributed to those who have been directly impacted by the hurricane. The goal is to deliver 5,000 food boxes. 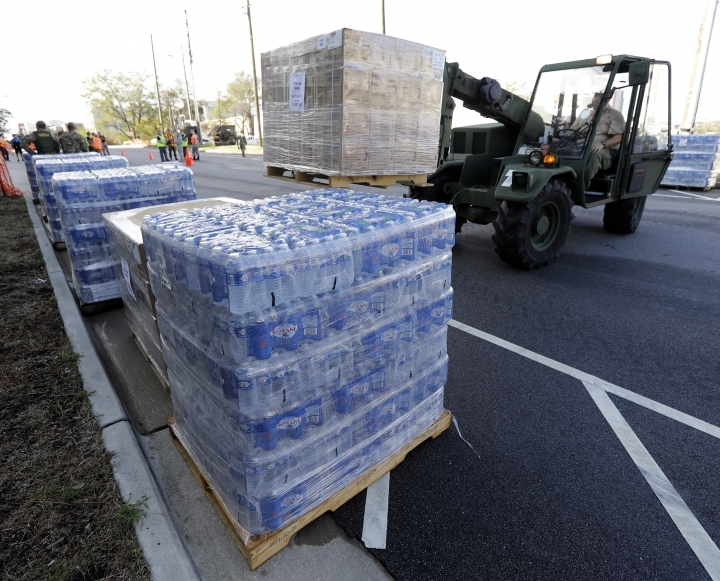 North Carolina emergency officials want to call in the Marines as a backup plan to transport vehicles and supplies to the Wilmington area in case two makeshift routes from the west become impassable by rising river waters. Transportation Secretary Jim Trogdon said Tuesday that the state is asking the Marine Corps to make the MV Cape Ray container ship available. He says the ship is returning from a mission in Florida. Wilmington remains largely cut off from the rest of the state because of closed portions of Interstate 40 and U.S. Highway 74. Trogdon says the ship could be made available as soon as Wednesday to take heavy vehicles and other supplies from the state's Morehead City port to the Wilmington port. Trogdon also says a state ferry route connecting to the Wilmington side of the Cape Fear River is being reopened for first responders. North Carolina officials say even though the sun is shining in parts of the state, major flooding is continuing in the aftermath of Florence and is expected to worsen in some areas. Gov. Roy Cooper says 16 rivers are at major flood stage Tuesday with an additional three forecast to peak Wednesday and Thursday. He says he knows for many North Carolinians it feels like "a nightmare that just won't end." About 10,000 people are in shelters across the state and around 343,000 are without power. 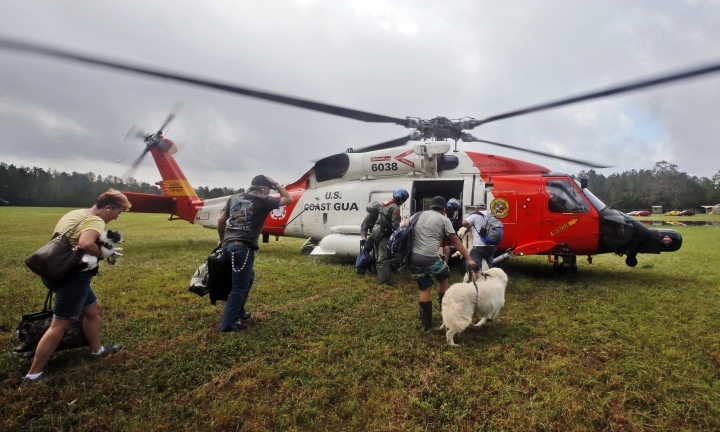 Cooper says first responders have reported rescuing and evacuating more than 2,200 people and about 575 animals. Officials say more than 1,100 roads are closed, 255 of those primary roads. The state's two major interstates, I-40 and I-95, are closed in many locations. There have been 26 confirmed fatalities in North Carolina due to the storm. Authorities have opened two routes into the city of Wilmington, North Carolina, which for a time was completely cut off by floodwaters. Wilmington Mayor Bill Saffo told a news conference Tuesday that two routes via Interstate 40 are now open. But Saffo and New Hanover County commissioner Woody White are still asking people to still stay away because those routes could flood again later. They also warned that other routes are still dangerous and sinkholes are developing under some of the flooded roads. Florence has claimed a 26th victim in North Carolina. Keith Acree is a spokesman for North Carolina Emergency Management. He said Tuesday that the 26th victim is a 71-year-old man who died Sunday when his car ran off North Carolina Highway 210 in Pender County and into floodwaters. The National Weather Service has confirmed that at least two tornadoes spawned by the remnants of Hurricane Florence touched down in Virginia. One of those was responsible for the death of a man just outside Richmond. The weather service in Wakefield, Virginia, says the storm has been categorized as an EF2 tornado, with winds of up to 120 miles (about 190 kilometers) per hour. Meteorologist Mike Rusnak says the weather service also confirmed a second tornado touched down in Mecklenburg County, Virginia, near the border with North Carolina. That tornado was measured as an EF0, with wind speeds of 80 to 85 miles per hour (about 130 to 135 kph). The second tornado brought down numerous trees and caused some structural damage. A flash flood caused by the remnants of Hurricane Florence has killed a man in Virginia. Virginia State Police spokeswoman Sgt. Keeli Hill says first responders found the man's pickup truck upside down and submerged in water that had flooded Route 607 in Louisa early Tuesday morning. The area was drenched by thunderstorms and torrential rain overnight. Hill says it appears that 59-year-old Richard Edward Kelih Jr. of Louisa was attempting to cross the road when his vehicle was overtaken by rushing water. This is the second death in Virginia attributed to Florence. On Monday, an employee of a flooring company was killed when a powerful tornado touched down in Chesterfield, just south of Richmond, leveling the building. Florence is spreading its misery. As the South continues to deal with massive flooding from the former hurricane, residents of the heavily populated Northeast are dealing with storm-related headaches of their own. National Weather Service meteorologist Chris Legro says he received reports Tuesday morning of boats being used to rescue people from rising water in Derry, New Hampshire. He said the rainfall was fast and furious, with more than 5 inches (13 centimeters) falling in Auburn, New Hampshire, in as little as six hours. In New York, several roads in counties along the Pennsylvania border have been closed by flash flooding. The National Weather Service says more than 4 inches (10 centimeters) of rain had fallen by Tuesday morning from the Elmira area to counties in southeastern New York. The weather service has issued flash flood warnings and watches for more than a dozen counties. Heavy rainfall from the remnants of Hurricane Florence sent tens of thousands of gallons of untreated wastewater into a tributary of North Carolina's Cape Fear River basin over the weekend. The City of Greensboro said in a statement Tuesday that about 63,000 gallons (about 240,000 liters) of untreated wastewater flowed from a sanitary sewer main for about four hours on Sunday. Officials blame infiltration from heavy rainfall accumulated from Florence. The untreated wastewater entered North Buffalo, a tributary of the Cape Fear River basin. Officials say the area was cleaned and flushed. Still stranded by Florence's floods, Wilmington, North Carolina, residents are lining up by the hundreds for free food, water and tarps as officials try to open new routes to one of the state's largest cities. Workers began handing out supplies Tuesday morning using a system that resembled a restaurant drive-thru: Drivers in long lines pulled up to pallets lining a street. They placed an order and left without having to get out. Todd Tremain needed tarps to cover up spots where Florence's high winds ripped shingles off his roof. Others got a case of bottled water or military ready-to-eat meals. An olive-green military forklift moved around huge pallets loaded with supplies. Wilmington is still virtually cut off from the rest of the state, but officials say they'll open routes as soon as flooding recedes and downed trees and powerlines are cleared away. South Carolina's governor plans to meet with top Department of Defense leaders to discuss the state's response to Florence. The South Carolina National Guard says in a news release that Gov. Henry McMaster was to meet Tuesday with U.S. Air Force Gen. Terrence J. O'Shaughnessy at the state's emergency response headquarters. O'Shaughnessy is Commander of the U.S. Northern Command and North American Aerospace Defense Command. Also scheduled to attend Tuesday's briefing are the chief of the National Guard Bureau and the adjutant general of South Carolina. 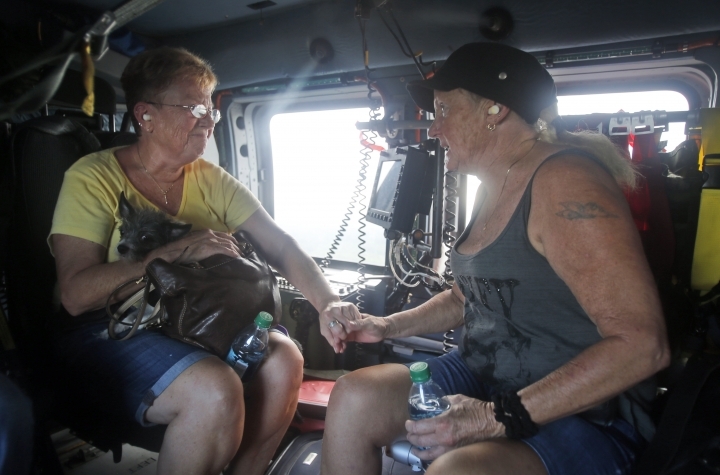 McMaster flew over parts of the state Monday in a National Guard helicopter, observing areas already experiencing flooding from Florence. Officials say flooding could continue to worsen for several days as water flows into the state from flooded areas in North Carolina. Officials are about to begin distributing food, water and tarps in Wilmington, North Carolina, which remains mostly cut off by floodwaters from Hurricane Florence. County officials say workers will begin handing out supplies to stranded residents in the city of 120,000 people beginning Tuesday morning. One road was opened into Wilmington at least briefly, and items have been brought into the city by big military trucks and helicopters. The death toll from Florence has risen to at least 32 people in three states, with 25 fatalities in North Carolina. Remnants of the once-powerful Category 4 hurricane are now a rainy, windy mass of low pressure. The system has speeded up on a path toward the heavily populated Northeast.